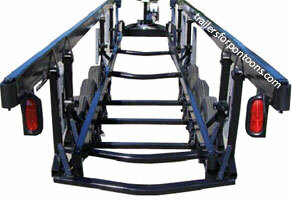 If you're in shallow water or want to store somewhere with low clearance, the center lift tri-tube trailer is perfect. 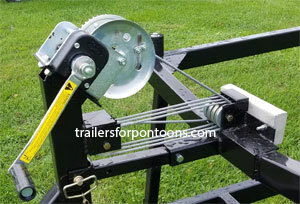 It’s a crank version of our popular hydraulic dealer use trailer. For 22' to 26' Triple Tube Pontoons - 25' Loading Bed - 32' Overall Length. 145R12” E range tires, 1520 lb. per tire capacity $10 per tire exchange. D range tires are for yard work. E range tires increase capacity and are recommended for road travel. 12” tall, 17” x 17”, roto-mold plastic Storage Blocks set of four $99. Most triple tube boats will need to be blocked when lowered. 2” x 5” top frame, 8 or 10 lifting arms. Raises with a 2600 lb. winch through an eight to one lifting system. Front stops with protective pad for the center pontoon. 12” radial tires on galvanized rims. LED lights in protective cages. HD Dual wheel jack. Takes a 49” center opening. Lowers to 27” (you will have to block some boats), raises to 43” (allows sufficient ground clearance for the biggest tubes). E-coat finish. Needs a 49” center opening. Lowers to 27” (you’ll have to block most boats). Raises to 43” (Plenty of ground clearance for big tubes). your boat never travels on cables. Designed for modern 8’6” boats but will fit older boats as long as you have 49” of clearance between the pontoons.